Early the following year I clearly remember driving up to the Webley HQ for a meeting with the directors Mike Hurney and Roger Williams to discuss the possibility of them purchasing the design of my new Single Stroke Pneumatic Rifle I do not remember the date but I do know it snowed both ways. The meeting had been set up by a mutual friend of mine and theirs. After a fairly short meeting an agreement was reached but unfortunately they did not like my rotary breach and wanted a Single Stroke rifle with bolt action and ideally a swan necked bolt handle. This unfortunately unappreciated by them at the time necessitated a complete redesign because a bolt system is no where near as efficient at driving the pellet as the rotary breach which deposited its air precisely in the centre as required. This meant that a different valve would have to be developed and as it turned out a completely new trigger system to go with it. This in turn required a completely different stock design. There had been no up front payment but a fairly generous royalty package was agreed so I was back to having to do more development with no real income in the short term. At the time I was working from a unit in Downton on land that the Landlord wanted to redevelop and therefore I needed to vacate. I was lucky enough to meet Bradley Howard and his partner Michael Dove who between them ran a very good small Engineering business called Mikina and they were very much interested in producing the new rifle for Webley. It was agreed that I would have a mezzanine floor area in one of their their workshops to work from while I produced the prototype new rifle and that we would talk further when it was finished and ready to go into production. Moving my workshop and the redevelopment of the new prototype rifle took a further 5 to 6 months and it had become apparent to me that this rifle could only be produced in .22 calibre initially and that further work would have to be done to make a .177 version at a later date. However, Webley approved the prototype and agreed manufacturing terms with Mikina for production to begin. It was during the test demonstration up at Webley that Mike Hurney came up with the new name " Paradigm". Meanwhile Mikina went out and purchased a Mazac integrex 200 1v multi axis machining centre to produce some of the more complex components faster than would otherwise have been possible on their already extensive range of 2, 3 and 4 axis CNC machines. This is a machine costing well over 250K. But what a piece of kit it is !!! This is something similar I found on YouTube, if you click play you will see a similar machine in operation. It is nearly 7 minutes long but a very interesting demonstration of the sort of equipment being used. This now gave me the freedom to design high quality complex parts accordingly. The Mikina machine is slightly more complex than the one shown as it was a special order specification with a nine axis capability and two tool changers. 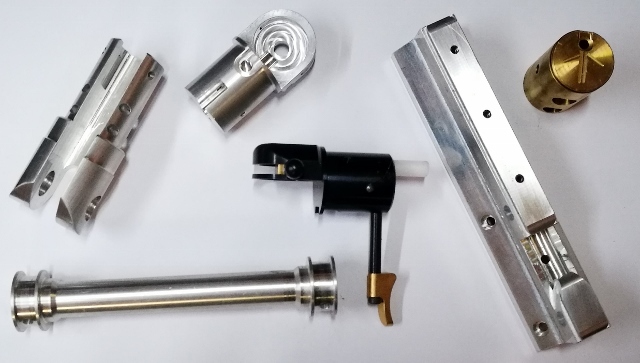 This is a picture of the Finished Trigger assembly and a selection of some Paradigm parts produced on the above machine. If you watched the video of the machine did you notice that it did the de-burring too? How many times have we all had rifles with the sharp edges still on them? However, Having one of the most up to date pieces of equipment in the country, may have been a shot in the foot for me because at that time we were at war with the Middle East and an extraordinary amount of ordinance was being used which had to be replaced and this machine ended up being commandeered to make some critical parts required. This effectively pushed the Paradigm project back by around a year. This is a 3D model picture of the eventual paradigm action shown in its cocked position and if you look closely you will notice that the air is trapped between the piston head seal (which has retracted by compressing the disc springs) and the valve face. It will be released by the poppet seal situated in the valve body moving back to open the transfer port when the trigger is operated. In addition to all the cocking forces and timing issues that have to be solved in order to make a reliable and efficient Single Stroke Pneumatic rifle, by far the most important consideration is the quality and design of the seals involved. I consider myself very lucky to have an excellent working relationship with Adam Hooper operations director of Martins Rubber in Southampton. It was the combination of us getting our heads together to produce all the specialist seals required that made this project work. In most cases I design a seal that I require, their technical department will then cast an eye over it and if viable they make me some samples which I then test and together we develop what is required for the function it has to fulfil. I think I am right in saying that the eventual poppet design was Adams Idea. Not only is that an unusual design but the material that it is made from is actually especially made for it too. We tested one of the rifles by cocking it on Friday afternoon and then I fired it on Monday morning with very little loss of performance. Most of the people I work with are at the top of their game and world leaders, that is why the F1 teams use them too. This is a paradigm with its final stock design, there are plenty of pictures of it in the prototype stock but not many of this version. This is a video produced in support of the Webley launch Strategy. The Paradigm was ready to come to market at the same time that Webley decided to drop their own sales staff and use Highland Outdoors as their sales outlet this effectively closed their operation in fact as far as I know there is only one very valued member of technical staff left and He has been there for ever. When this happened Highland Outdoors dropped the Paradigm from their books I suspect because since it was to be made in the UK the ratio of purchase cost to sales price was not as good as they could get from Turkey. At this time Mikina had just made delivery of the first preproduction rifles to Webley but having allowed them to keep one, we withdrew the others back to the factory. Therefore, the Paradigm is a very rare rife at the moment because there are only the four that I have supplied at various times and I am not sure if it is three or four left back at the factory. I tend to feel that there is a time and a place for any particular type of product and I think the big requirement for a Single Stroke Pneumatic Rifle, if indeed there ever was one, has come and gone, now that there are cheap multi shot PCPs and pumps available from around £300. However, there are always a discerning number of people who want something unusual especially if it is made to a high quality standard. When Webley closed the project they signed over the Patent, the Paradigm name and the 150 or so stocks that had been made by Custom Stock to me. However none of it, is of any use, unless I have the actions to put in them, otherwise they are just a lot of expensive fire wood. This left Mikina, Martins Rubber and me vastly out-of-pocket and it took all of us a very long time to get over it. However, Mikina have now agreed that if I can get enough customers, they will make the actions required but the minimum batch size would be 50 rifles. My objective would be to try to sell 150 to use up the stocks I have now got. The First New Paradigm to be built in many years is nearing completion and will be ready on the 13th of October this year. Anyone wanting one in this instance, should make contact via the Contacts page to register their interest as we cannot sell from here.